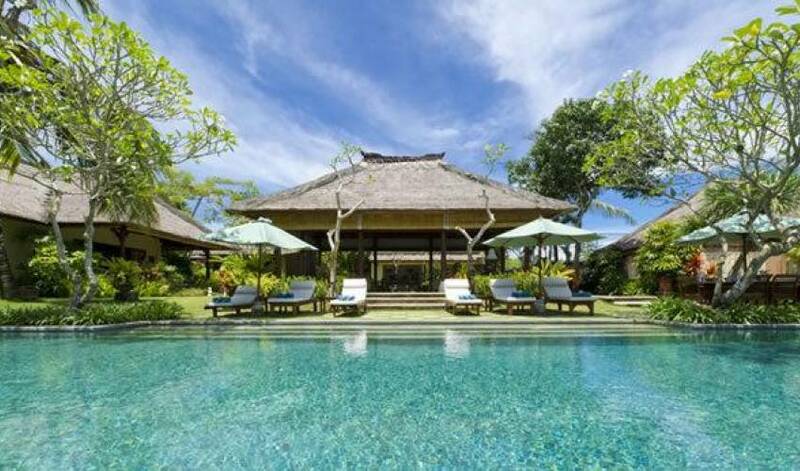 Bordering a river and the sloping rice terraces in the village of Umalas in south-west Bali, this Luxury Villa is a serene five-bedroom holiday home of thatched roof pavilions set amidst a vast garden with an 18-metre swimming pool as its centrepiece. 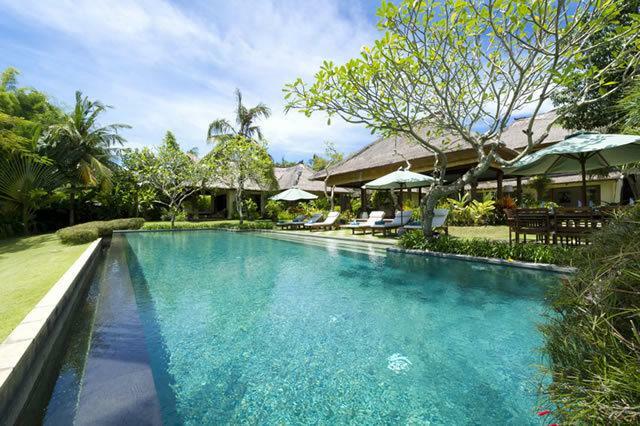 Designed like a Balinese family compound the villa is a stunning example of early Bali style, with open-sided living areas and air-conditioned ensuite bedrooms, all mod cons and a tennis court. 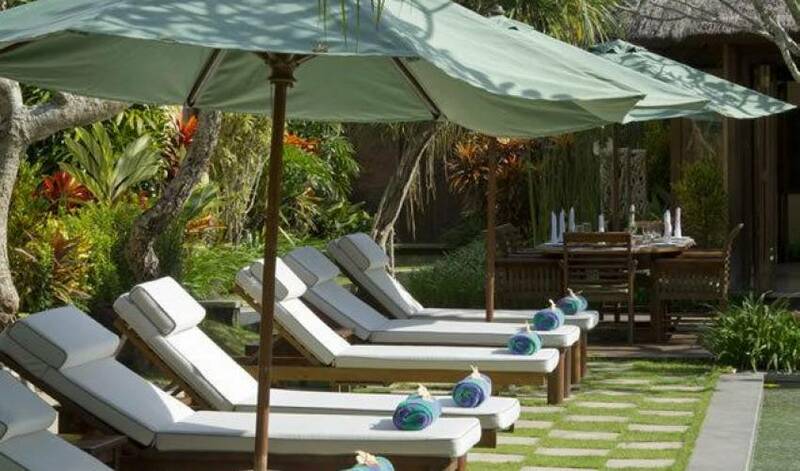 Great for families and even better for weddings, it comes fully staffed, and is only five kilometres from Seminyak’s restaurants, nightlife and the beach. 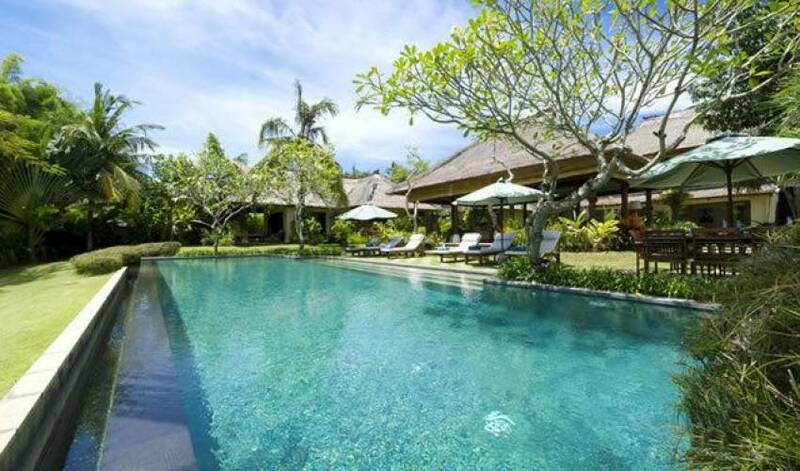 The villa is a sublime introduction to Bali villa living that will embrace you in its charm and make you never want to leave. Built as a family home this delightful five-bedroom property is uniquely infused with touches of colonial elegance, high-quality interiors and furnishings and all the modern creature comforts required for the perfect tropical villa holiday. Here, classic good taste is mixed with understated simplicity and our ever-happy team of staff are further evidence that this is indeed a relaxed ‘home away from home,’ welcoming you with a warmth and informal hospitality that will melt away your stresses and tensions. 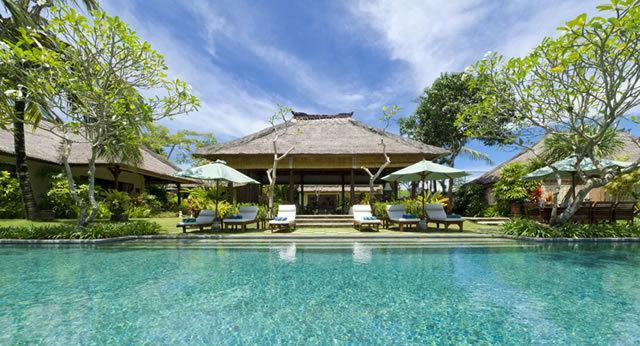 Set amongst 2,750sqm of mature, riverside gardens overflowing with tropical flora and water features, we designed the villa as a series of charming thatched buildings in the style of a traditional Balinese family compound home. 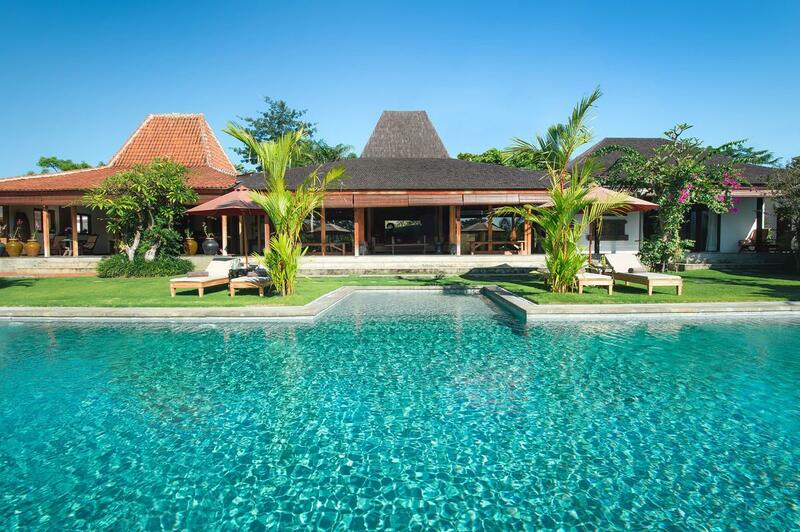 At Villa you will find spacious bedroom pavilions with comfortably furnished private terraces and pretty ensuite garden bathrooms, encircling a welcoming, open-sided living pavilion that faces the centrepiece 18-metre pool. Sun loungers, outdoor and indoor dining areas and an additional lounge/TV room on a wide upstairs veranda, provide more than enough options for both private and social moments. 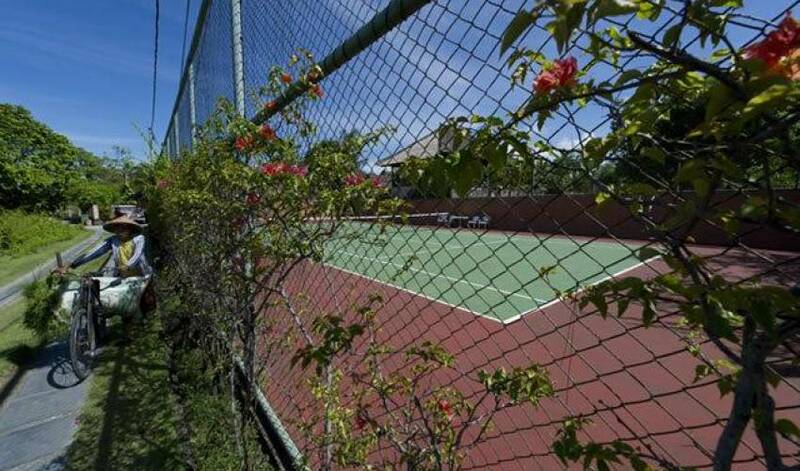 Recreational facilities include three TVs and DVD players, iPod docks and a tennis court. 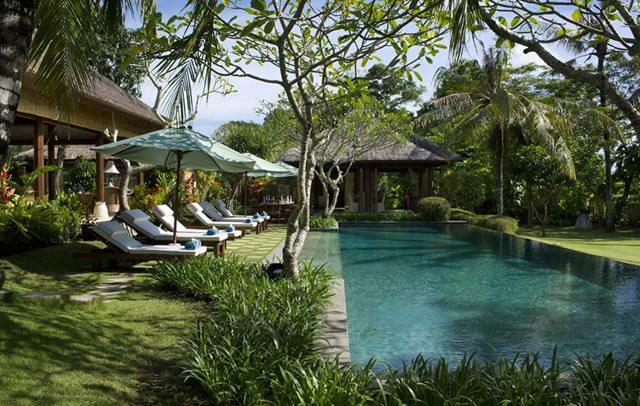 The villa features several alang alang thatch-roofed pavilions generously spread throughout an immaculately landscaped riverside garden. At the centre of the compound, and facing the pool, is an informal, open-sided living room. 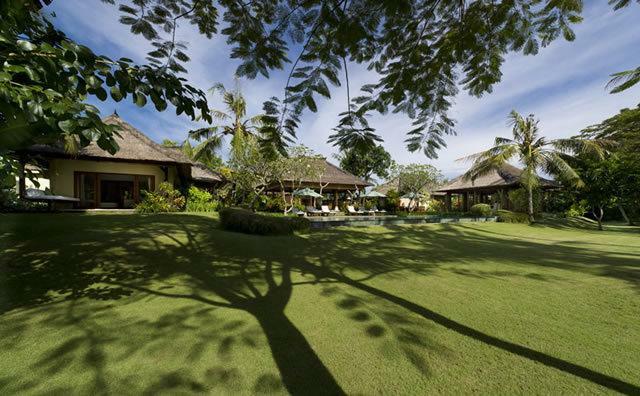 Stepping-stone pathways set in lush green lawns lead to a master suite, principal guest suite and a double-storey pavilion, containing three bedrooms and a second, veranda-style, living area. Another pavilion, overlooking the swimming pool, houses the formal dining room and adjoining kitchen. 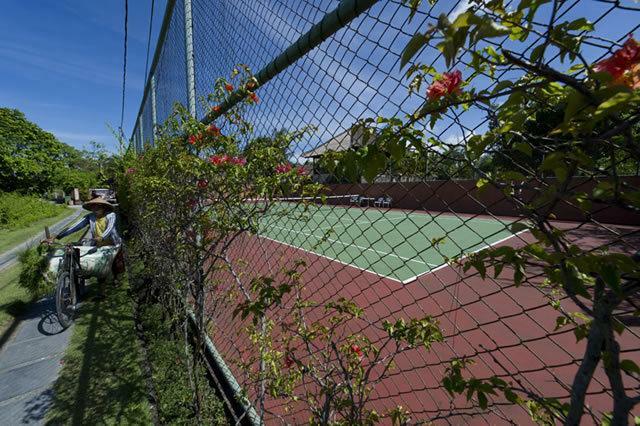 A hard tennis court rests in the far corner of the grounds. 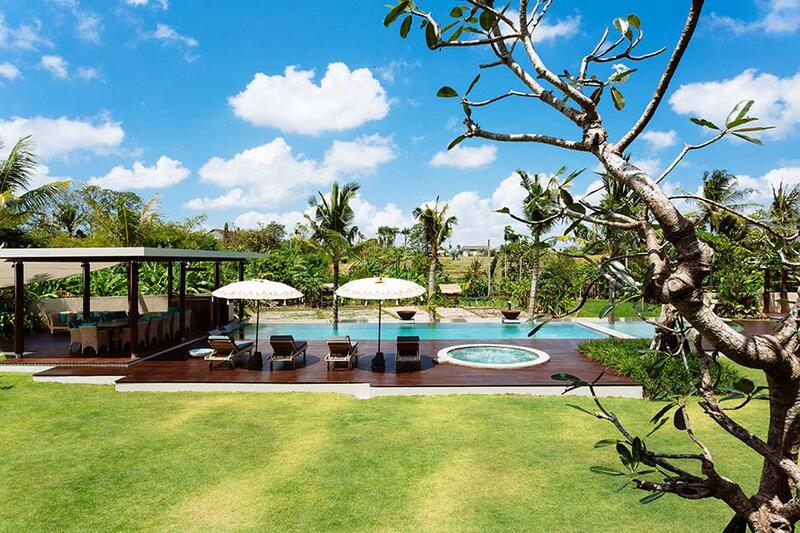 Heart and hub – literally – of the property, the open-sided living pavilion looks out over the pool, the gardens and the rice fields beyond. Two comfy sofas and a deep daybed with white cushions frame a large antique coffee table making a sociable space which is attractively and subtly lit at night, while a satellite TV, camouflaged in a wooden cabinet along with DVD player and Bose sound system offer audio-visual distraction. In tropical yet homely style, this room features terrazzo stone floors and soaring alang-alangceiling, and is kept cool with natural breezes and ceiling fan. Understated décor includes candles, fresh orchids and traditional carved artefacts. The villa’s gardens consist of gorgeously spongy lawns, edged with tropical foliage and trees, criss-crossed with stone-paved pathways and decorated with intricately carved stone wall panels. The striking 18 x 7-metre infinity-edge pool is bordered on one side by a simple grass and stone deck where cushioned sun loungers beckon. 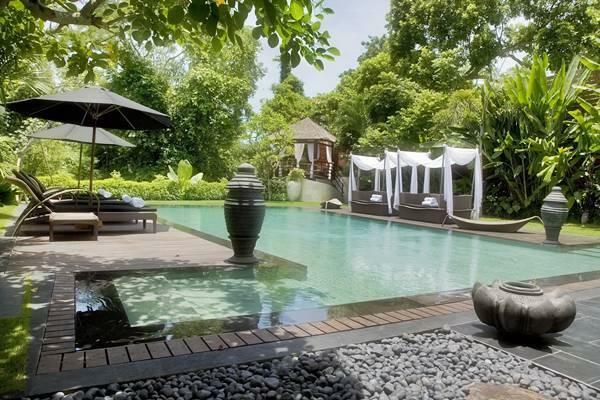 Lawns slope down from the far side of the pool to 60m of river frontage, edged with exotic palm fronds and coconut trees; the low wall encircling the gardens allows maximum views of the rice fields beyond. Dusk is a particularly lovely time in the garden at the villa. 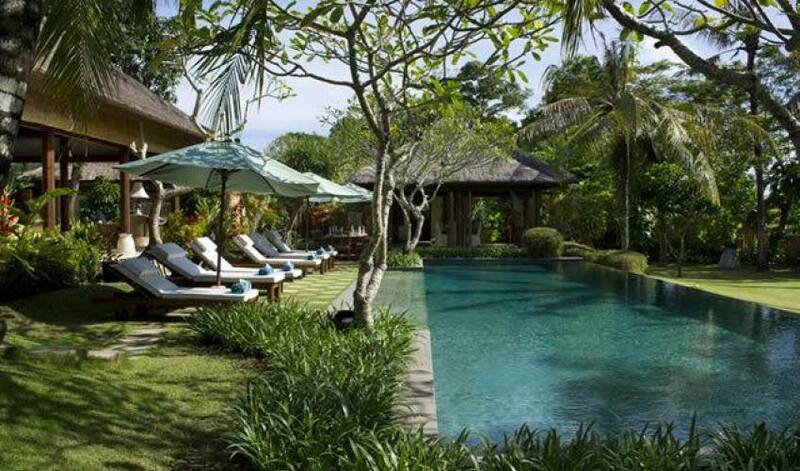 Take a dip in the pool and appreciate the peaceful rice-field views, as the fading sunlight stretches across the water, or wander the many hidden corners of the garden, which is magically illuminated at night with pretty Balinese lanterns and fire beacons. Courtesy of their flexible, family-friendly configurations, the villa’s five spacious air-conditioned bedrooms can sleep up to 10 Adults + 4 Kids. 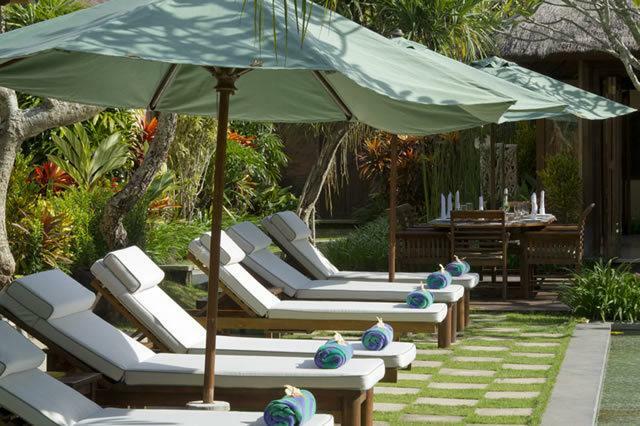 All rooms are simply but very tastefully presented with top-quality teakwood furniture. For lovers of open-air living, glass sliding doors and ceiling fans allow natural breezes to flow through. The villa’s outrageously comfortable beds boast king-coil mattresses, stacks of pillows and cushions and the finest quality bed linens. Rooms are individually colour co-ordinated and feature attractive rugs, floor cushions and thick curtains. 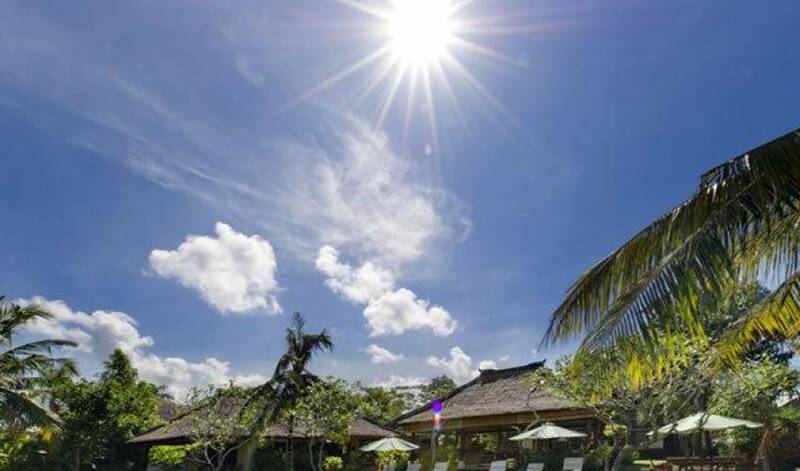 With the exception of the second storey bedroom, ensuite bathrooms are open-air Balinese style, with terrazzo stone floors and delightful enclosed tropical gardens walled for privacy. An open stairway to the right of bedrooms three and four leads up to a breezy veranda and the fifth bedroom. Overlooking the gardens and with views out to the fields and rice terraces beyond, this second-storey bedroom is more traditionally Asian in style. With its lofty ceiling, bedroom five is furnished with a romantic queen-size four-poster bed plus an antique wood wardrobe and desk. A set of aged timber doors leads to the only indoor bathroom of the house, with low ceiling, walk-in glass shower cubicle and, similar to the bedroom, cool terrazzo stone floors. 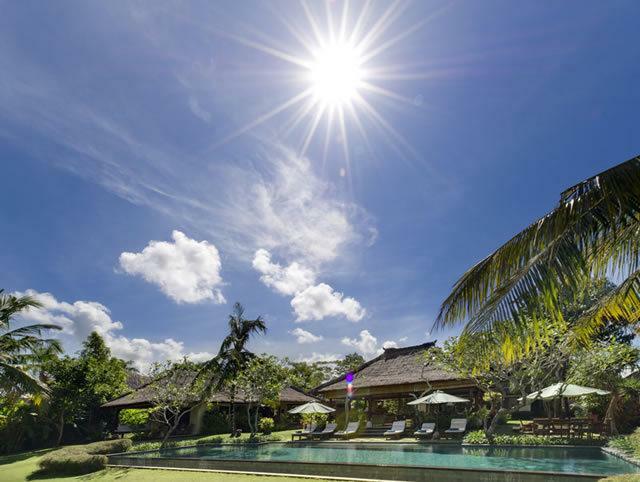 This Luxury Umalas Villa is located at the edge of the village of Umalas, one of a group of small rural communities that constitute the Kerobokan district, just north of bustling Seminyak. 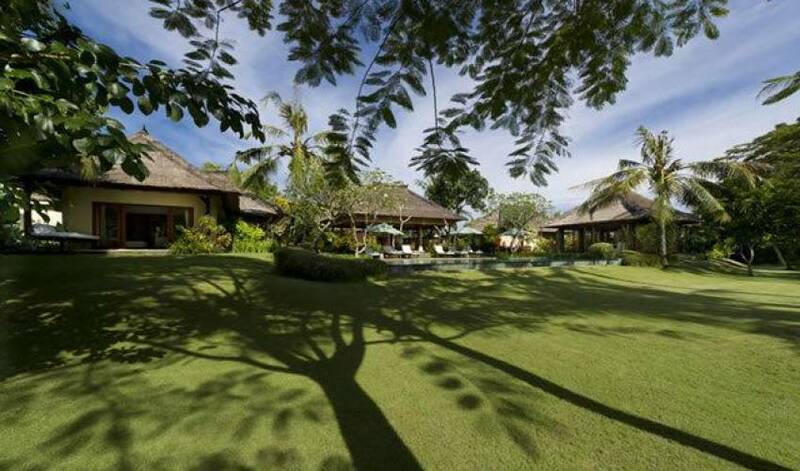 Umalas is home to a growing number of foreign-owned residences and traditional dwellings.